The outline of long-since disappeared buildings and other archaeological features can often be located by dowsing. Also, it is frequently possible to estimate, by dowsing, the dates the building was constructed and demolished, its use, occupancy, number of floors and many other interesting features. 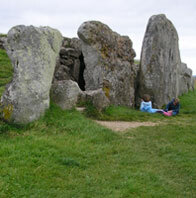 West Kennet Long Barrow near Silbury Hill, Avebury. A World Heritage Site. If there are traces of the original materials buried under the surface, the location and depth below the surface can be estimated. Some of Peter Golding's dowsing predictions have already been confirmed by geophysical surveys. In 2003 Peter was asked to locate the site of the long-lost Castle in his local town of Dursley. His map-dowsing search for a sixteenth century castle led him up to the Recreation Ground where he then received reactions for the outline of the moat, walls, rooms, doors, windows, and the drawbridge to the main entrance with its arched double doors. He engaged a company with geophysical surveying equipment, and they confirmed traces of the walls where dowsing had indicated. An 1810 painting of a new Tabernacle, also showed the remains of the castle doors and drawbridge where Peter had predicted. 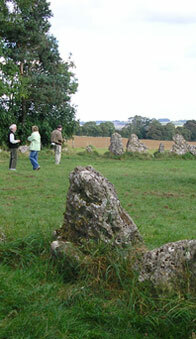 The Rollrights Stone Circle, Warwickshire. Slimbridge dowsers visited during the annual Congress of the BSD in 2007. We were given an explanation of the circle, and many members dowsed for the energies associated with the stones.